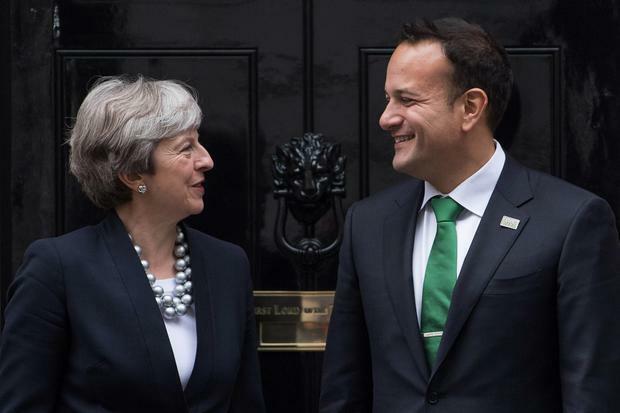 TAOISEACH Leo Varadkar has said it is not his job to help the UK Prime Minister come up with a solution to her Brexit dilemmas. Ahead of a meeting of EU leaders this week, Mr Varadkar indicated that little progress will be made on resolving the issues over the Irish border. But he said there will be a signal from the EU that negotiations must now intensify. Asked what he could do to help the embattled Theresa May, Mr Varadkar replied: “‘It’s not my job to help Mrs May. The people of the United Kingdom decided on Brexit and it’s not my job to help Prime Minister May or the United Kingdom government. The draft conclusions of Thursday’s EU summit have already been agreed by the 27 EU member states before the leaders’ meet. They acknowledge that some progress has been made in the Brexit negotiation – but not on how to keep the Irish border open after the UK leave the union. “EU countries are reaffirming their commitment to insisting that there is a backstop in the withdrawal agreement. There can be no withdrawal agreement without a backstop,” Mr Varadkar said last night. He said negotiations “need to intensify in the coming weeks”. “We are waiting for the British to produce their white paper on the future relationship. That is due in early July. “It will be an intensification of negotiations rather than a stalling of negotiations,” the Taoiseach said. The possibility of a ‘no deal’ Brexit is also looming large now with EU countries set to agree to ramp up preparations for the worst case scenario. “I don’t think that is likely. Nobody does but we have to think it is a possibility. And that means making preparations in our ports and airports for that eventuality,” Mr Varadkar said. He noted that October is “the last time that you could realistically have a withdrawal agreement finalized because it does require parliamentary ratification both by the UK parliament and the European Parliament and we would like to give the time between the end of October and the end of March to do exactly that”.